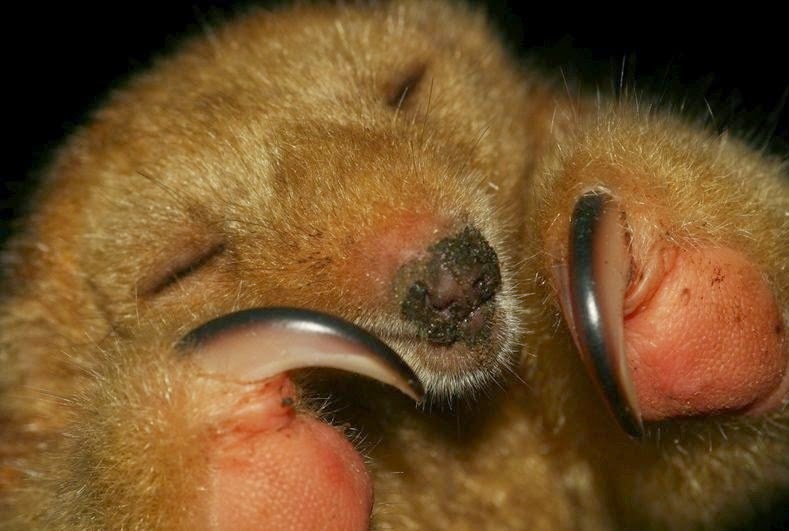 This cute, squirrel-sized critter is a silky anteater, the world’s smallest anteater. These creatures are rarely seen in their natural habitat due to their small size and their arboreal and nocturnal lifestyle. The species inhabits a range of different forest types, including semideciduous, tropical evergreen, and mangrove forests. Individuals have been sighted in altitudes ranging from sea level to 1,500 m (~4.921 ft). The pygmy anteater is the smallest out of the 4 surviving anteaters (suborder:Vermilingua). Adults have a total length ranging from 36 to 45 cm (14 to 18 in.) including a prehensile (grasping) tail that is 17 to 24 cm (~6.7 to 9.5 in) long. Weight ranges from 175 to 400 g (6.2 to 14.1 oz). Overall, they are slightly larger than a human palm. Fur is dense and soft, with the color ranging from grey to yellowish, with a silvery sheen. Some subspecies have darker, often brownish, streaks, and paler underparts or limbs. A dark line runs down the head, neck and back. The soles of the feet are pink. The eyes are small and black and the species has an elongated tapered snout with a tubular mouth. The tongue is long and equipped with small spikes and mucus, making it perfect for capturing its prey, aroboreal ants. The silky anteater is the only anteater that doesn't possess any teeth. 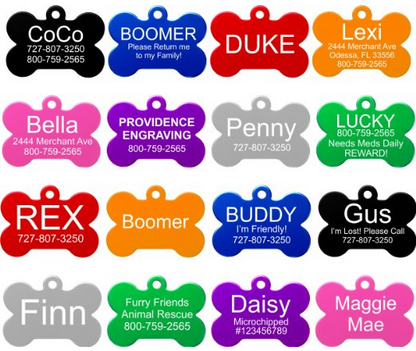 The ears are short and rounded. C. didactylus has long claws on its front feet, used for climbing and tearing open ant-nests. The claws are present on the second and third toes , with the latter being much larger. The fourth is very small and claw-less, whereas the other two are vestigial and not visible. The hind feet have four toes of equal length, each with long claws, and a vestigial hallux that is not visible. The ribs are broad and flat, overlapping to form an internal armored casing that protects the chest. The average lifespan in the wild has not been determined but it is less than two years. One specimen survived for 2.3 years in captivity. However, further research is required to determine the species' maximum longevity. The silky anteater is strictly insectivorous and feeds exclusively on arboreal ants, eating between 700 and 5,000 every day. According to some sources, it may occasionally also consume other insects, like termites and small coccinellid beetles. The silky anteater is an extremely slow animal that can easily fall prey to large, predatory birds when spotted. Prevention is always better, so camouflage is the first and main line of defense. They keep themselves out of sight during the day by curling themselves up into a perfect ball in the trees, about 20 m above the ground, atop a tightly packed nest of dry leaves. Individuals seem to prefer the tree Ceiba, which has large seed pods that contain masses of a silky silverish fiber. The sheen of the pods and the silky fur of the anteater are almost identical. .As a result, predators have a really hard time spotting them. This includes even predators with excellent vision like the harpy eagle (Harpia harpyja), the spectacled owl (Pulsatrix perspicillata). and other birds of prey. When cornered, the pygmy anteater will defend itself by standing on its hind legs and holding its fore feet close to its face, so it can strike with its sharp claws any hostile animal that tries to get close. 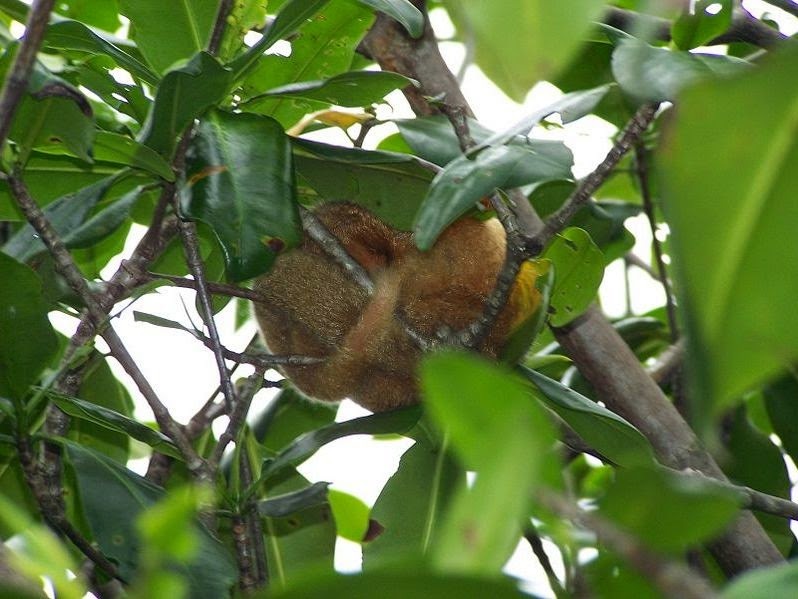 Silky anteaters are very difficult to spot and as a result we know very little about their behavioral patterns in the wild. They are nocturnal and arboreal and very rarely descend to the ground. They typically stay alone, except when breeding and raising their youngs. They seldom show any signs of aggression. Gestation of the silky anteater lasts between 120 and 150 days, after which the female gives birth to a single young, once per year, usually in September or October. The mother places the young in a nest of dry leaves in a hole in a tree trunk. The newborn is raised by both parents, and the male sometimes carries the young on its back. The youngs are born furred, with a similar color pattern to adults. At first, they only eat regurgitated, semi-digested food that is provided by both parents. They begin to take solid food when they are about one-third of the adult mass. At about nine months of age, the young begins to go out on its own, and by one year, it is fully-grown and ready to survive by itself. Man pets a pygmy anteater. So cute! 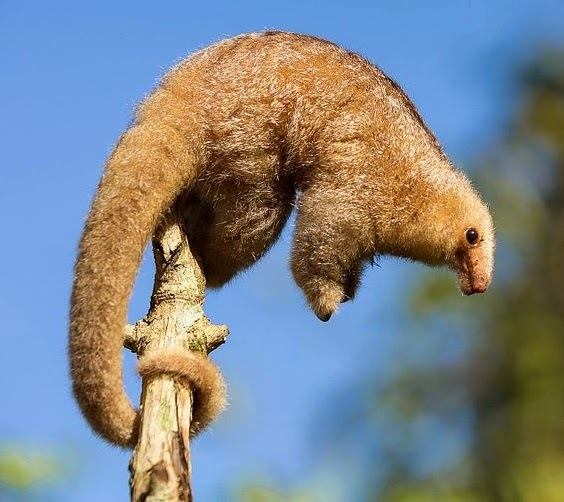 The silky anteater is currently listed by the IUCN as of Least Concern, due to its wide distribution, presumed large populations and occurrence in numerous protected areas. The species has also shown a "tolerance of a degree of habitat modification, and because it is unlikely to be declining fast enough to qualify for listing in a more threatened category". Currently there are no major and immediate threats endagering this strange animal. Although general deforestation is taking place over many parts of its distribution, C. didactylus remains widespread in the Amazon Basin and there are many healthy populations with steady or possibly increasing trends. In some areas, individuals are captured and kept as a pets in the country of origin, despite their relatively short lifespan. - Xenarthrans were previously classified alongside the pangolins and aardvarks in the order Edentata. Edentata means toothless, because the members do not have front incisor teeth and lack, or have poorly developed molars. 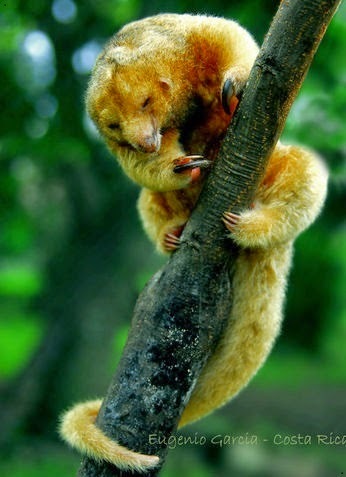 - The silky anteater emits a shrill call when threatened. - Gardner, A.L. 2005. Order Pilosa. The Johns Hopkins University Press, Baltimore, Maryland, USA. - Reid, F. 1997. 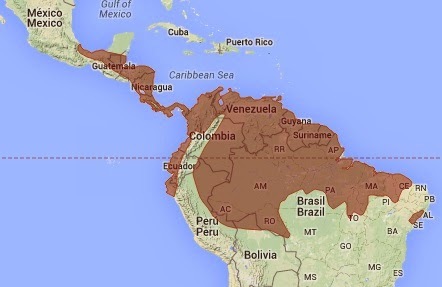 A field guide to the mammals of Central America and southeast Mexico. Oxford University Press, New York, USA. - Miranda, F., Meritt, D.A., Tirira, D.G. & Arteaga, M. (2014). "Cyclopes didactylus". IUCN Red List of Threatened Species. Version 2014.1. International Union for Conservation of Nature. Retrieved 2014-07-07. "Pugmy" is not a word. The only correct spelling is "PYGMY."